Sandy sparked the Rutgers professor’s interest in helping to engineer smart cities, where everything is connected; renewable energy, green infrastructure and sustainability reign; and resilience after breakdowns, disasters and malicious attacks is critical. His research on smart cities is being conducted with Janne Lindqvist, an assistant professor of electrical and computer engineering and expert on human-computer interaction, and Arnold Glass, a professor of cognitive psychology in the School of Arts of Sciences. They’re one year into a four-year, $916,000 National Science Foundation (NSF) grant through the Critical Resilient Interdependent Infrastructure Systems and Processes (CRISP) project. Virginia Tech and Florida International University researchers have related NSF grants. One of the challenges is to try to isolate failures, which can spread from one infrastructure to others. 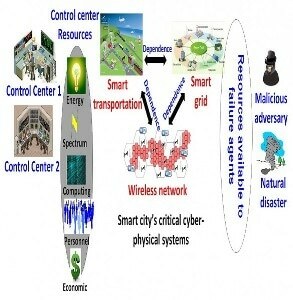 Protecting smart cities from failures and damage requires making critical infrastructures resilient and reallocating resources toward recovery efforts, said Mandayam, associate director of Rutgers’ Wireless Information Network Laboratory (WINLAB). Psychology plays a key role because you must account for how you influence people’s behavior and how people’s behavior influences the design of a smart city. The goal is to nudge people to behave better and make the right choices, leading to sustainability, and how you frame questions or make proposals is important, Mandayam said. “Understanding how people behave is integral to a smart city and that’s why the project is interesting on so many levels,” he said.